Old Orchard Beach is a fantastic beach for running. It’s nearly 7 miles from the southern end at Camp Ellis to the northern end at Pine Point, with great views of Saco Bay and Prouts Beck. 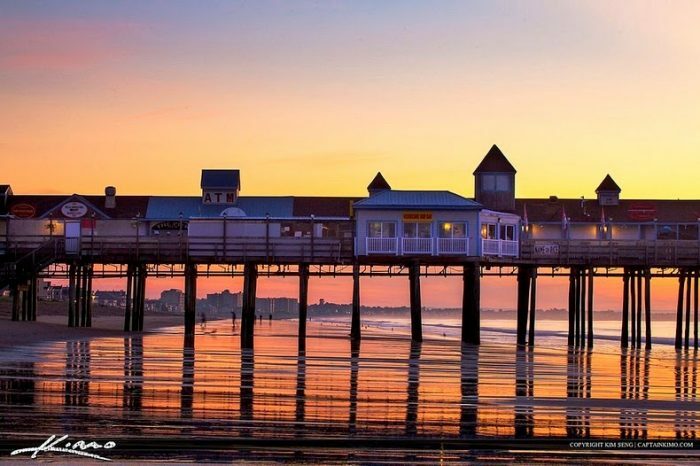 The signature spot of Old Orchard Beach is the 500-foot pier. The beach is flat and wide, with consistently excellent running conditions. The full 7 miles includes Saco, Old Orchard, and Scarborough Beaches. At the southern end, if you want to go all the way to Camp Ellis/Ferry Beach State Park, there’s a break at Goosefare Brook where depending on the tides you might have to wade across or head up to the road briefly. From the break heading north, it’s 1.3 miles to the Pier, and 3 miles from the Pier north to the end at Pine Point Beach, with views to Prouts Neck. From the break heading south, it’s 2.4 miles to the end near Fairhaven St. There are all sorts of attractions at Old Orchard Beach, including shops, restaurants, and the only amusement park on a beach in New England. The Downeaster Amtrak train runs several times a day from Boston — its 1.5 hours and inexpensive. Old Orchard hosts several running events annually, listed here. Add-Ons: Nearby, there are other great areas for running and walking, including Goosefare Brook Memorial Park, Ferry Beach State Park, and Pine Point. There are also spurs leading to the Eastern Trail.